Tractatus venerabilis Inceptoris Guilgelmi Ocka[m] de sacramento altaris. William, of Ockham. Paris, . 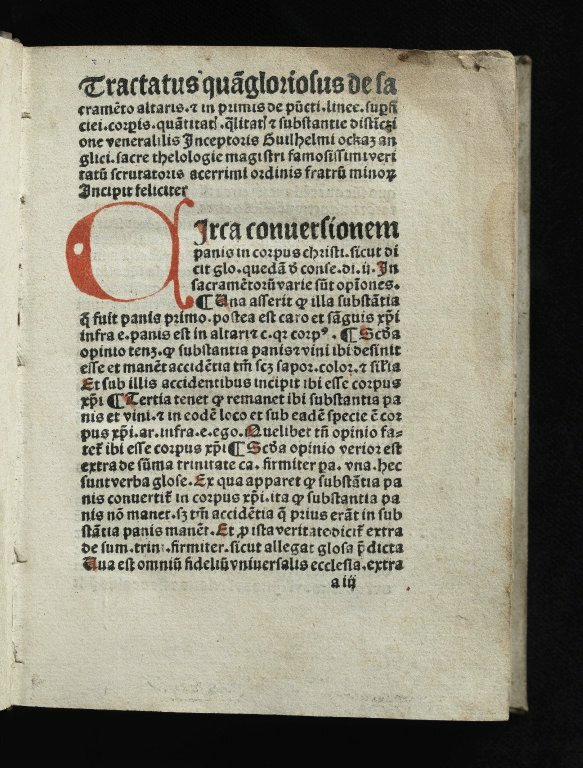 New College Library holds this copy of William of Ockham’s De Sacramento Altaris, a treatise on the Eucharist, in the Incunabula collection. William of Ockham was born at Ockham, near Guildford in Surrey in 1287 and he died on the night of April 9 1347 in Munich. The future theologian and philosopher entered the Franciscan order before the age of fourteen. He was educated at the Franciscan convent in London, and developed an academic career as a lecturer and theological writer in Oxford and London. His unconventional views attracted attention within the Church and in1324 Ockham was apparently summoned to Avignon to have his writings examined for heresy, but in the end no formal condemnation took place. However his life came to a crisis after he challenged the doctrine of Pope John XXII, saying that Jesus and the apostles owned no property but, like the Franciscans, lived by begging and the generosity of others. Along with other Franciscans he fled to Munich where he ended his days. The methodological principle known as “Ockham’s Razor” states that among competing hypotheses, the one that makes the fewest assumptions should be selected. It is described as a razor because it distinguishes between hypotheses by “shaving away” unnecessary assumptions. (1) Spade, Paul Vincent and Panaccio, Claude, “William of Ockham”, The Stanford Encyclopedia of Philosophy (Fall 2011 Edition), Edward N. Zalta (ed. ), URL = <http://plato.stanford.edu/archives/fall2011/entries/ockham/>. 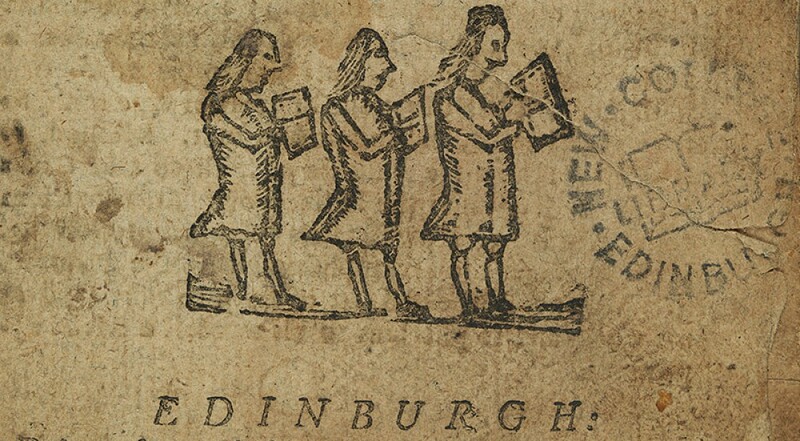 Religion Past and Present is now available on trial access to University of Edinburgh Users. Access is available on campus and off campus via the VPN. The trial ends on 14 February. See the eresources trials web page for more information. Religion Past and Present (RPP) Online is the online version of the updated English translation of the 4th edition of Religion in Geschichte und Gegenwart (RGG) which aims to be the definitive encyclopedia of subjects connected with religion. Oxford Handbooks Online is now available on trial access to University of Edinburgh Users. Access is available on campus and off campus via the VPN. The trial ends on 14 February. See the eresources trials web page for more information. Oxford Handbooks Online aims to provide scholarly research reviews from the world’s most trusted scholars. The ‘Religion’ category contains 978 entries and the ‘Philosophy’ category 1,181, and articles can be downloaded as pdf files. Currently in the display is Why there almost certainly is a God : doubting Dawkins, by Keith Ward. This book was purchased to support the Atheism in Debate course at the School of Divinity, University of Edinburgh. You can see an regularly updated list of new books for New College Library on the Library Catalogue – choose the New Books Search and limit your search to New College Library. Here’s a quick link to new books arriving in the last few weeks. A word of caution – some of the books listed here may still be in transit between the Main Library (where they are catalogued) and New College Library, so not on the shelf or in the display just yet.